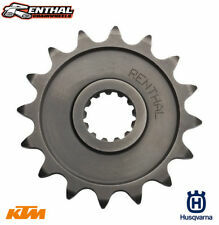 Renthal Front Motocross Sprockets for KTM and Husqvarna Bikes - Renthal Motocross Enduro Sprockets. With 35 years of experience in racing and countless successes along with the best riders in the world, Renthal are regarded as a leader in the industry. Click here to see the full description. 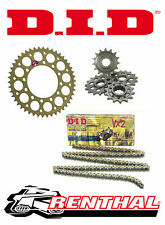 Renthal / D.I.D 520 Pitch Race Conversion Chain & Sprocket Kit. 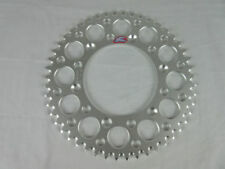 Renthal Steel Front Sprocket. Renthal Hard-Anodised Rear Sprocket. The 7075 T6 aluminium alloy rear sprockets are 66% lighter than steel, yet incredibly durable. 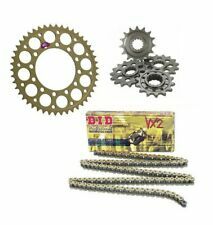 This kit includes a 120 link Unibear Red heavy duty chain constructed with japanese technologoy and supplied with a renthal steel front sprocket and an alloy rear renthal sprocket. Honda CRF250R not CRF250X as chain will not be long enough. Renthal Front Gearbox Sprocket. 1 tooth smaller than standard sprocket size for better acceleration. 520 Race Chain Pitch. If you do not see what you require, ask us! Renthal Front Gearbox Sprocket. 1 tooth larger than standard sprocket size for lower engine revs when cruising and higher top speed. Standard Chain Pitch. If you do not see what you require, ask us! Marchesini Rear Wheel Renthal Rear Sprocket 42 Tooth 397U 520 42. Condition is New. Dispatched with Royal Mail 1st Class. 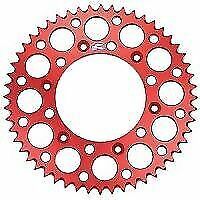 Renthal 45T Rear Sprocket 409-525-45 fits Suzuki GSXR750 2000-2010. Condition is New. Renthal Hard Anodised Alloy rear sprockets are manufactured to extremely tight tolerances from a special material developed to withstand the rigours of road riding and road racing. The 7075 T6 aluminium alloy rear sprockets are 66% lighter than steel, yet incredibly durable. Their advanced tooth profile, concentricity and accuracy of fit provide maximum power transfer and long-life. Renthal Hard Anodised Alloy Rear Sprocket. The 7075 T6 aluminium alloy rear sprockets are 66% lighter than steel, yet incredibly durable. Their advanced tooth profile, concentricity and accuracy of fit provide maximum power transfer and long-life. Suzuki SV650 /SV650S '99-'17 47T 520 Renthal Rear Sprocket Alloy. Hard Anodised. Renthal Front Gearbox Sprocket. Standard number of teeth and Standard Chain Pitch. If you do not see what you require, ask us! 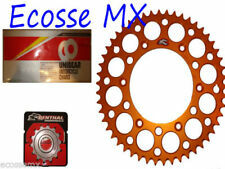 Honda CR125 Chain and Sprocket Kit. This kit includes a Unibear118 link gold heavy duty chain constructed with japanese technologoy and supplied with a renthal steel front sprocket and an alloy rear renthal sprocket. Renthal Front Sprockets are simply the finest front sprockets on the market today. They feature specially developed Nickel-Chrome-Molybdenum steel, case hardened and core refined to give the ultimate combination of strength and hardness. Renthal Front Gearbox Sprocket. 1 tooth smaller than standard sprocket size for better acceleration. Standard Chain Pitch. If you do not see what you require, ask us! Fits KTM SX250 EXC250 XCW250 1991-2018. This kit comprises a DID gold/black heavy duty chain (will probably require cutting to length) a supersprox alloy rear sprocket and a renthal steel gearbox sprocket. UNIBEAR orange heavy duty chain. Renthal gearbox sprocket. Renthal rear alloy sprocket. KTM Chain And Sprocket Kit. 1992-2019 Rear Sprocket 48,49,50,51,52 teeth. Kit consists of 125/144/150/200/250/300/400/450/500/505/520/525/530. RENTHAL REAR SPROCKET CARRIER. 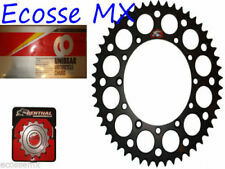 FITS THE FOLLOWING BIKES WITH A RENTHAL 462-525 462-520 (RACE USE) REAR SPROCKET. 1199 PANIGALE/R RACE USE 2012-2015. MONSTER 1200 2010-2017. 1098/S/R 2007-2008. I KEEP ALL MY RECEIPTS. YZF 450 2004 -2008. 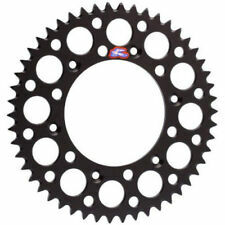 Renthal Gearbox Sprocket. Fits Suzuki RM125 1980-2011 12 teeth. Front Sprocket. Suzuki GSR 600 2006-2010 Renthal Gearbox Sprocket 16T 525 New. STD Size 16T 525. BMW S1000 RR/Sport 2009 onwards 17T 520 Renthal Race Front Gearbox Sprocket. Renthal Front Gearbox Sprocket. One tooth larger than standard and Standard Chain Pitch. If you do not see what you require, ask us! 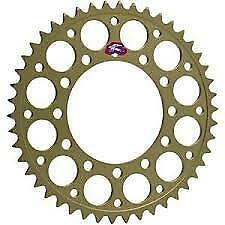 Renthal 42 T Rear Sprocket 478U-520-40ha - Aprilia RSV4/Factory 10-16 520 PITCH. Condition is New. Dispatched with Royal Mail 1st Class.